Dutch “Stoomvaart Maatschappij Nederland” (Netherlands Steamship Company 1870-1970) shipping line playing cards produced by Nederlandse Speelkaarten Fabriek, c.1910. The four scenic Aces (shown right) offer a virtual tour of the destinations en route to the Far East starting from Amsterdam and then visiting Southampton, Lisbon, Tangier, Genoa, Colombo, Singapore and Java. The court cards are in fantasy 16th century style costumes. 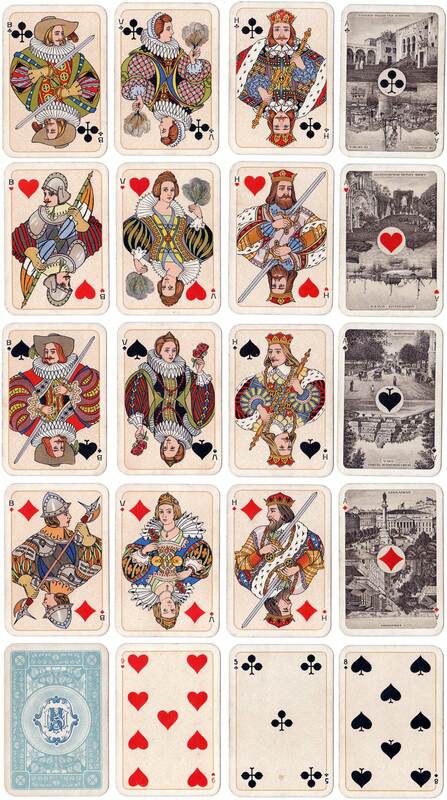 Above: “Stoomvaart Maatschappij Nederland” shipping line playing cards produced by Nederlandse Speelkaarten Fabriek, c.1910. The back design has the S.M.N. monogram. Images courtesy Rex Pitts.